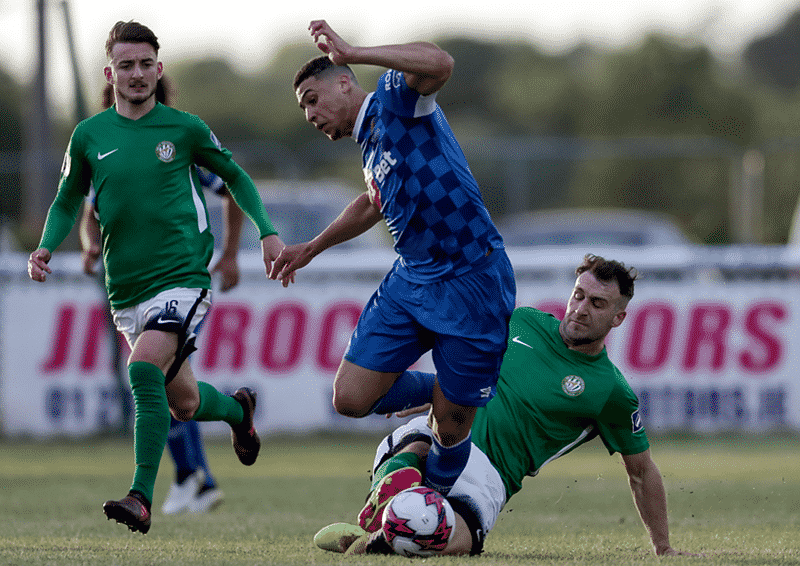 Waterford FC picked up a point on the road on Friday night in the Carlisle Grounds after a 0-0 draw against Bray Wanderers in the SSE Airtricity League Premier Division. The result sees the Blues sit third in the table going into the mid-season break, behind Cork City and Dundalk. The Blues made two changes after last week’s 2-0 win against St Pat’s; Faysel Kasmi and David Webster were replaced by Dylan Barnett and John Martin. The Blues started well and looked to strike early. Gavan Holohan played into the space down the right for Ismahil Akinade. His cross looked to find Courtney Duffus but was blocked and dropped back to the striker. His second cross was cleared only as far as Bastien Hery but his strike didn’t trouble Wanderers keeper Evan Moran. Bray had two chances of their own as Craig Walsh fired over Matthew Connor’s crossbar, before Cory Galvin forced Connor into a good save after being found by Kevin Lynch’s throw-in. Duffus had a good chance midway through the first half; he collected from Holohan but his strike was well blocked. Nine minutes before the break, Duffus was again looking dangerous. 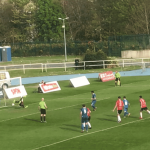 Akinade found strike partner Duffus in front of goal but Wanderers defender Rhys Gorman threw himself in front of the powerful strike to block. The home side should have taken the lead two minutes before the break; Dan McKenna found Craig Walsh inside the area on the endline with the goal at his mercy, but a poor touch meant the chance was gone and Connor did well to block. Walsh had another good chance just minutes into the second half but Connor was again equal to his effort. Courtney Duffus then had a good Blues chance; he cut inside from the left and forced Bray keeper Moran into a smart save. Izzy Akinade was next to threaten when he ran onto John Martin’s excellent through ball but the striker was just off target under pressure from Bray defender Sean Heaney. A good Blues move with 13 minutes left on the clock saw Sander Puri find the run of Derek Daly down the left. He crossed to the back post to find the smart run of Dean O’Halloran but the attacker just couldn’t get enough on the ball. Daniel Kelly forced Connor into a smart save as Bray looked for a winner before Dean Walsh’s strike at the other end was well blocked after good work from Akinade. The Blues had calls for a penalty turned down as the games entered the final minutes; Derek Daly raced into the penalty area before a challenge from Sean Harding, but referee Robert Hennessy waved play on. At the other end, Daniel Kelly flashed a strike wide of the goal as the Blues picked up a point on the road. Bray Wanderers: Evan Moran, Sean Harding, Rhys Gorman, Sean Heaney, Kevin Lynch, Dan McKenna, Paul O’Conor, Craig Walsh, Daniel Kelly, Cory Galvin (Jake Kelly 90), Ronan Coughlan. 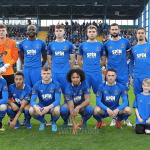 Waterford FC: Matthew Connor, Dylan Barnett, Rory Feely, Kenny Browne, Derek Daly, John Martin (Dean Walsh 80), Bastien Hery, Gavan Holohan (Dean O’Halloran 41), Sander Puri; Ismahil Akinade, Courtney Duffus.